QACP emphasizes socialization and incorporates academics through play – the way young children learn best. Parents, through participation, observation, and parent education, gain skills in child guidance and learn how to meet children’s physical, mental, social, and emotional needs. The class pages below provide an overview of the class structure. Each year the class selects additional Curriculum Enhancements that help supplement the core program and include guest instructors (Yoga, Creative Dance, Music) as well as field trips for the older classes (Guided tour of the woods of Discovery Park during Forest Animal Week, Insect safari, Instruction from a circus and acrobatics school in preparation for the annual PreK Class Circus, Traditional Japanese tea ceremony while studying about Asia). 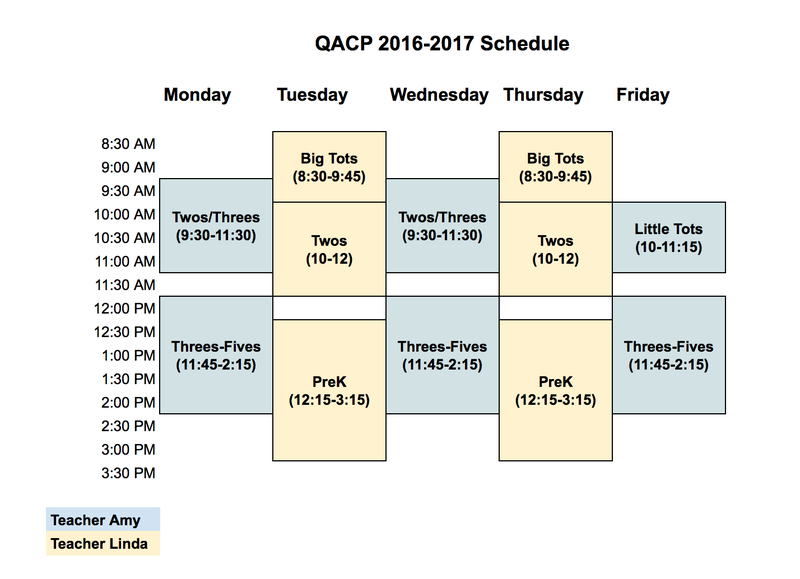 For information on QACP’s current 2016-2017 schedule, please see below. To learn more about QACP’s schedule for 2017-2018, please click here. Little Tots love to explore our classroom with their parents. Big Tots are natural explorers. Two-year-olds are curious about everything. Two-(going on three)-year-olds are beginning to make social connections. Social development is taking off in the 3s-5s class. Drop-off care for siblings on your classroom workday.